Originally run from Sunny Orlando, we’re back onilne in the great Mid-West states bringing you the best BBS experience. Perfecting time travel since 2016, come back in time with us! This is a recreation of my 1990’s Leisure Time BBS from Alamogordo, NM. It is part of SynchroNet and FidoNet echomail systems. I have a large amount of Sunrise Doors as well as a multibbs game server connection. I used to run my BBS for a long time on C64’s New Image v1.2a (modded) back in the dialup days and later when the telnet boards started becoming a thing…until I had a corruption with my hard disk. 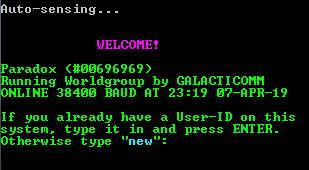 The BBS has JoinLink, Circle MUD, UDs (C64, Amiga and Win/PC) and Subs areas.